Recently someone was very kind at work to bring in limes from their tree at home. There were bags of them left in the kitchen, so I grabbed a number of them and then pondered about what I could create. I used the limes in a few things, including a lime chilli marinade for prawns (amazing by the way! ), but I thought the last few deserved to be made into something sweet and delicious! 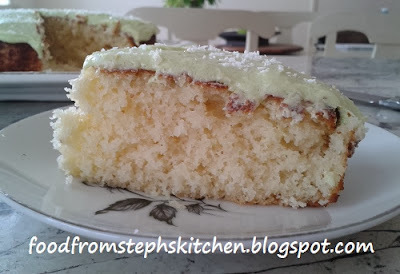 I love lemon cake so I thought a lime version would be great - and coconut goes great with lime! 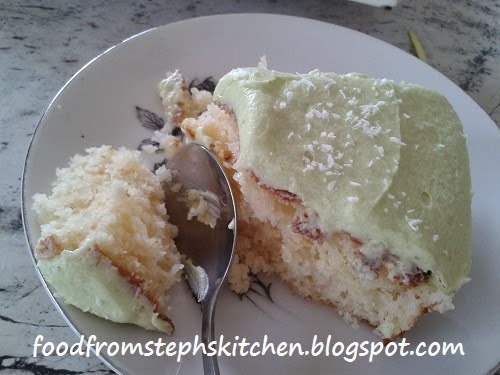 Once this idea entered into my mind I just had to create this lime coconut cake; soft and fluffy with a lime and sweet coconut flavour. I then took my whipped butter icing and added in lime zest and juice to make a lovely citrus icing, which really finished it off amazingly. Before you forget, pre-heat your oven: 180 C (fan forced), 200 C (electric), 400 F.
With electric beaters or a mix master, cream the butter and sugar until light and fluffy. 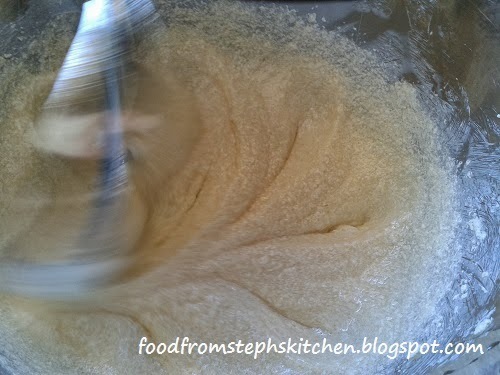 Add both eggs and the vanilla, beating again until the mixture is thick and looks like cake mixture. My Mum has always told me this is the trick to a fluffy cake, and in my experience it always results in a light and fluffy cake every time. Next add the coconut, then alternate adding the flour and milk bit by bit. I like to make sure that each time I add the flour or milk that I beat up the mixture again until it's nice and fluffy. Finally fold through the lime juice by hand; keep folding the mixture until the texture is smooth and creamy. Add the mixture to a greased cake tin and bake it in the oven for 25-30 mins. It is best if you test the cake with a skewer at the 25 min mark, taking it cake out of the oven if the skewer comes out clean. Depending on your oven it could take a little bit longer. Once cooked allow the cake to cool while you start on the icing. In a small bowl whip up your butter or margarine until fluffy. I usually use margarine and just a wooden spoon, but you can also use electric beaters. Add the icing sugar bit by bit (if you are using beaters, start on a slow speed until the icing sugar is mixed into the butter). Once all the icing sugar has been added, mix through the lime zest and juice, followed by a few drops of green food colouring. 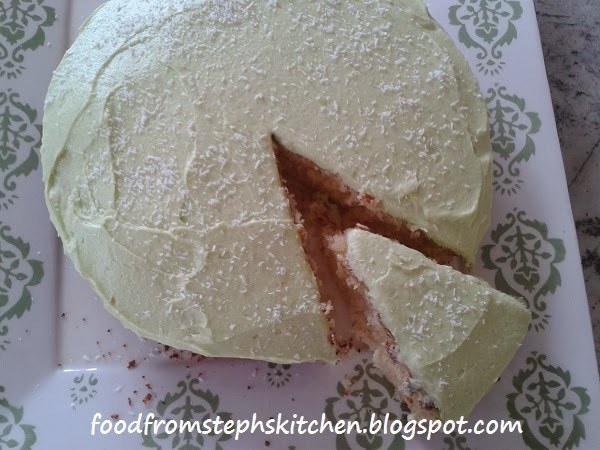 You don't have to add the colouring but I really liked the icing having a little bit of green to it. The green colour also reinforces the lime flavour, as green is often a colour associated with lime flavours. A little like if you saw strawberry ice cream that wasn't pink it might not taste as "strawberry" in flavour; just fascinating, isn't it? Ensure that the cake is cool to touch before spreading the lime butter icing on top, sprinkling a little bit of coconut on top as the final touch. Now, make a nice big cup of tea (or coffee!) and enjoy a large piece of cake! Thanks Sophia! It really is as fluffy as it looks. The icing is a yummy addition as well.